Top Line for years has specialized in manufacturing custom fabricated products designed specifically to meet our customers’ requirements. Our primary objective has always been to design and manufacture these specialty products by using state-of-the-art manufacturing practices and technologies. Top Line and its affiliates employ engineers with a vast range of expertise and knowledge in the bioprocessing and pharmaceutical industries. The benefit of this is our ability to provide quick and accurate solutions to even the most complicated problems that occur in the field. All specialty products are manufactured using good manufacturing practices and are put through a very rigid quality control inspection before leaving our facility. These practices ensure that our customers receive quality parts ready for immediate installation. Top Line also offers a line of multi-ported divert valves that are very popular in process applications where space considerations are critical. 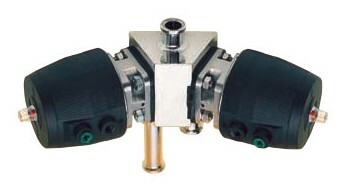 These valves are compact and will significantly reduce the piping requirements and number of connections associated with more complex designs. 100% BPE Compliant with full material traceability. Wide variety of inlet and outlet tubing configurations and polish combinations are available. Design eliminates dead leg inherent in typical mixing or diverting applications. Available with actuated or manual bonnets. TOP-FLO® Divert Valves are available in 2-way through 8-way configurations and can be supplied with actuated or manual bonnets. Bodies that make up the valve are machined from 316L stainless steel. Other materials are available upon request. These valves are supplied with a clamp or weld end connection in sizes ranging from 1/4” through 4”. This patented design can be used to divert flow or as a mixing valve. The inlet flow passage with the divided flow prevents abrupt directional change and fluid impact, minimizing cell deterioration. The TOP-FLO® 2-Way Divert Valve will drain in either the horizontal or vertical position. All other combinations will fully drain in the vertical position. The flow pattern on the closed side of the valve will allow for a continuous flow to the open side providing zero deadleg.